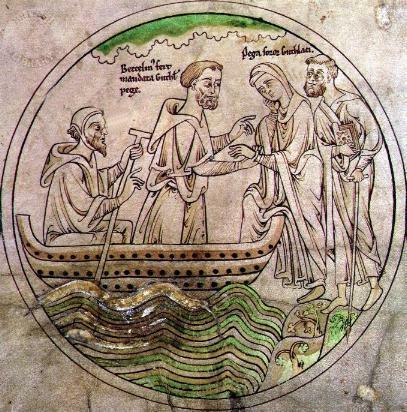 Guthlac at Croyland in the marshes of the Wash.
England once looked very different. Much of southern Britain was marshland for most of the island’s occupied history. These bogs, fens, and marshes ensured that areas of virtual wilderness persisted from before Roman Britain through the Norman period and beyond. Despite the difficulties of using fenlands, these areas were not only occupied throughout the Anglo-Saxon period, but important centers like Croyland, Bardney, and Ely eventually developed in the marsh. “There is in the Midland district of Britain a most dismal fen of immense size, which begins at the banks of the river Granta not far from the camp which is called Gronte (Cambridge) and stretches from the south as far north as the sea. It a very long tract, now consisting of marshes, now of bogs, sometimes with black waters overhung by fog, sometimes studded with woodland islands and traversed by the windings of tortuous streams.” (Hill, 1981:11 cited in Gowland & Western, 2011). It has long been known that Britain can environmentally support endemic malaria. Malaria was fairly wide-spread in 19th century Britain when it was first mapped (figure to left) (2). The upper black area on the map includes much of ‘the Wash’. However, proof of malaria is more tenuous for the medieval period. Together with the unhealthy reputation of the brackish marshlands there is at least enough evidence to suggest that endemic malaria reached back into the late medieval period. Malaria went by a variety of local names before the early modern period. Malaria-like fevers are mentioned in literature from Geoffrey Chaucer to William Shakespeare (2, 3). Terminology for malaria was not settled upon the Italian ‘malaria’ until the early modern period. Before then, it went by a variety of terms the most universal being ‘ague’, meaning the shakes, and sometimes ‘fever and ague’ referring to the cyclic breaking of a fever. Gowland and Western (2011) took a new approach to finding evidence of malaria in Anglo-Saxon England (400-1100 AD) (4). Malaria caused by Plasmodium vivax causes chronic hemolytic anemia that may result in cribra orbitalia due to the expansion of the bone marrow in the cranium. 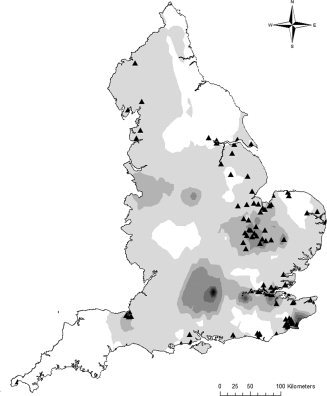 Gowland and Western correlated the presence of cribra orbitalia in Anglo-Saxon skeletal remains with the presence of the malarial vector Anopheles atroparavus and reports of ‘ague’ in 19th century England. 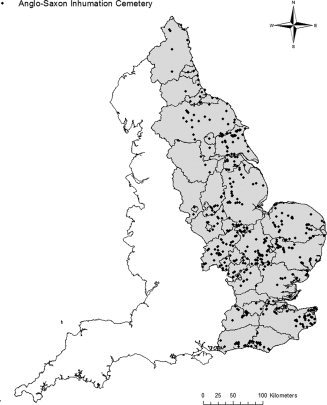 The Anglo-Saxon cemeteries used in their study are mapped in the figure below on the left. Note that not many cemeteries are located near the modern coastline of ‘the Wash’. This area would have likely been too wet for settlement. Gowland and Western determined areas capable of sustaining malaria by mapping the presence of A. atroparvus from a 1900 AD British Museum survey (shown above on the right) (4). The darker the shading the more reports of mosquitoes. This survey was reported to not have been systematic, so they augmented it with 19th-century ‘ague’ reports (triangles). There are some notable areas with high levels of mosquitoes that lack ague reports. This map was used to determine malarial regions for correlation with either cribra orbitalia or the poor nutrition control enamel hypoplasia. It also roughly correlates with the 1840-1910 malaria incidence in the color map above by Kuhn et al (2). In this last map, malarial areas are plotted with hot and cold spots for cribra orbitalia. Purple and blue areas on the map indicate the highest areas of A. atroparvus in 1900, while red and orange circles indicate the cribra orbitalia ‘hot’ spots. Areas of cribra orbitalia correlate very well with malarial areas around the Wash. Cribra orbitalia ‘cold’ spots (blue circles) correlate with areas of low A. atroparvus. They found no correlation between enamel hypoplasia with either ‘malarial’ or ‘non-malarial’ areas (4). If this cribra orbitalia is due to malaria, it is likely an underestimate of the amount of malaria in the English wetlands. Cribra orbitalia forms in children so it will not indicate adults who contract malaria. Communities like Ely, Croyland and Peterborough were large monasteries who probably drew many into the marsh as adults. Confirmation of malaria in Anglo-Saxon England will have to wait for molecular evidence, but this skeletal evidence strengthens the hypothesis that it was endemic in early medieval Britain. It also should be informative for the areas to concentrate efforts to find molecular evidence. (1) Cameron, M.L. (1993, repr. 2006) Anglo-Saxon Medicine. Cambridge University Press. I was thinking about this just last week. Wondering if home-grown anemia treatments would be helpful in some mild cases (e.g. plunging hot poker into wine or cider to heat it–and shedding iron). I doubt that iron would be easily absorbed, though. Thanks for this info. Very useful. Eating iron rich animal products like liver would have been more helpful, I would think. Any red meat (beef, sheep, horse, venison) would also be iron rich. Pork and chicken are less iron rich. So iron-deficiency anemia could be protective against malaria? How would you distinguish iron def. anemia from malaria induced anemia in a skeleton? Thanks for the paper. It looks like something I should read. Just looking at those cribra pictures make my eyes hurt. Michelle, yep, but it’s hard to get haem iron if one isn’t eating animals–if one is following a penitential Lent diet, for example. I was trying to think of ways around that. Especially ways to increase acidity/vit C to facilitate absorption (if Lent is early, and there’s no fresh stuff around). 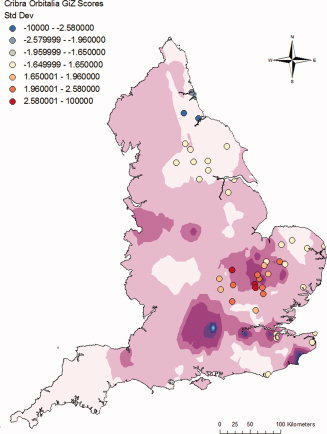 Mapping malaria in Anglo-Saxon England. An interesting look at using skeletal remains and historical reports to reconstruct disease distribution. I’m currently working with Dr Gowland on my PhD research looking at biomolecular evidence for malaria from Roman to medieval skeletal populations in the Fens – hoping to get some reliable positives! I’m glad to hear that Dr Gowland’s team is still looking for molecular evidence. Good luck on your PhD research!